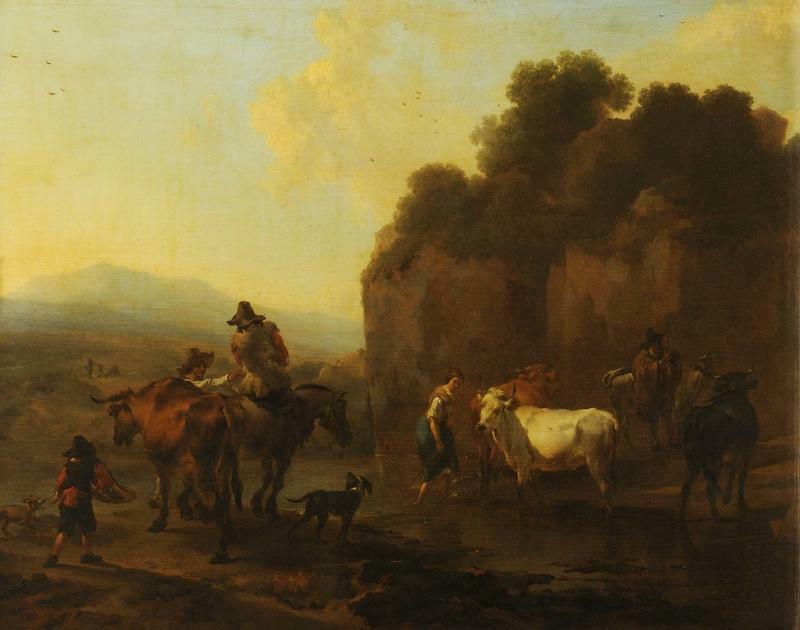 Nicolaes Berchem returned to the subject of peasants herding cattle across a stream throughout his life. This painting appears to date from the late 1650s when Berchem used a strong colour palette, elegant figures and warm Italian light. The shepherd is very similar to one that appears in a print of c. 1655-60. The subject gave Berchem the opportunity to show horses and cattle from various angles as well as creating idyllic Italianate landscapes where rocky escarpments plunge into tranquil pools. The ford provides a natural rest on the peasant's journey, adding to the peaceful and bucolic air of the theme. Berchem was a native of Haarlem specialising in landscapes, hunts, battles, allegories and history painting. He travelled to Italy at some point in the 1640s or 1650s, and brought back a mass of landscape studies which provided the backgrounds for his Italianate pictures for the rest of his life. Berchem was one of several Dutch artists who painted landscapes infused with features taken from the Italian countryside. He continued to make many drawings throughout his life, including careful studies of the different animals that appear in his work. He was one of the most prolific and well-paid artists of his day working in both Haarlem and Amsterdam. Large numbers of paintings in a similar style were made by pupils and followers, some of which have been misattributed to Berchem. His paintings were highly sought after in 18th-century France and many engravings were made after his works. Before the painting entered the Rothschild collection, it was bought and sold several times around the middle of the 19th century when his works began to fall out of favour. Bought in Paris, perhaps from M Eynard, by John Smith (b.1781, d.1855); sold by Smith to James Stuart-Wortley, 1st Baron Wharncliffe (b.1776, d.1845) before 1829; bought back by Smith; sold by Smith to Henry Labouchere, later 1st Baron Taunton (b.1798, d.1869); bought back by Smith, probably before 1852; sold by Smith to G Pennell; sold by Pennell to Baron James de Rothschild (b.1792, d.1868); by descent to his son Baron Edmond de Rothschild (b.1845, d.1934); by descent to his son Mr James de Rothschild (b.1878, d.1957); given to Waddesdon, The Rothschild Collection (The National Trust) by the Treasury Solicitor in lieu of taxes on the Estate of Mr James de Rothschild in 1963. Ellis Waterhouse, Anthony Blunt; Paintings: The James A. de Rothschild Collection at Waddesdon Manor; Fribourg; Office du Livre, The National Trust; 1967; p. 128, cat. no. 52, ill.